The medical record has been a problem ever since Hippocrates, in a moment of spite, invented it. Until the advent of the electronic record it had existed on paper and was stored in a variety of inaccessible locations by the Department of Medical Records, or by a similarly named entity. Once entombed in the medical record room it could safely, and usually accurately, be assumed to be lost. This quantum like state of being nowhere in particular has both advantages and disadvantages. Obviously, it was useful to know what had happened to your patient before the current encounter. But trying to find useful information in a stack of paper defaced by illegible handwriting was a task beyond the patience of most physicians. Thus, on those rare occasions when the record could be recovered, its auditors rarely got beyond the top few pages; or they limited their perusals to anything that was typed rather than written. The question – how do you hide a dollar from a surgeon? answer, you put it in the patient’s chart – applied equally to most other specialties. The military, a model of efficiency compared to medicine, partially solved the medical record problem by giving the patient’s chart to the patient. Thus, when a soldier moved from one post to another he took his record with him. This procedure made losing the chart harder than in civilian life as the patient cared more about his chart than did the record room, but it couldn’t force his doctors to read it. The arrival of personal computers and their insertion into every aspect of modern life made the medical record an irresistible target for the medical bureaucracy. In 2009 congress mandated in a key provision of the American Recovery and Reinvestment Act that by January 1, 2014, all public and private healthcare providers must have adopted and demonstrated “meaningful use” of electronic medical records (EMR) in order to maintain their existing Medicaid and Medicare reimbursement levels. Thus, our medical goose was cooked or rather electrocuted. Physicians were now commanded to spend more time in front of a computer than face to face with their patients. Software systems which cost a lot were installed and doctors were told to use them or find a different way of making a living. These programs were proprietary and often didn’t talk to each other. They frequently impaired rather than facilitated the transfer of information. This federal mandate was a bonanza for the software manufacturers, but another unfunded mandate for medical providers. 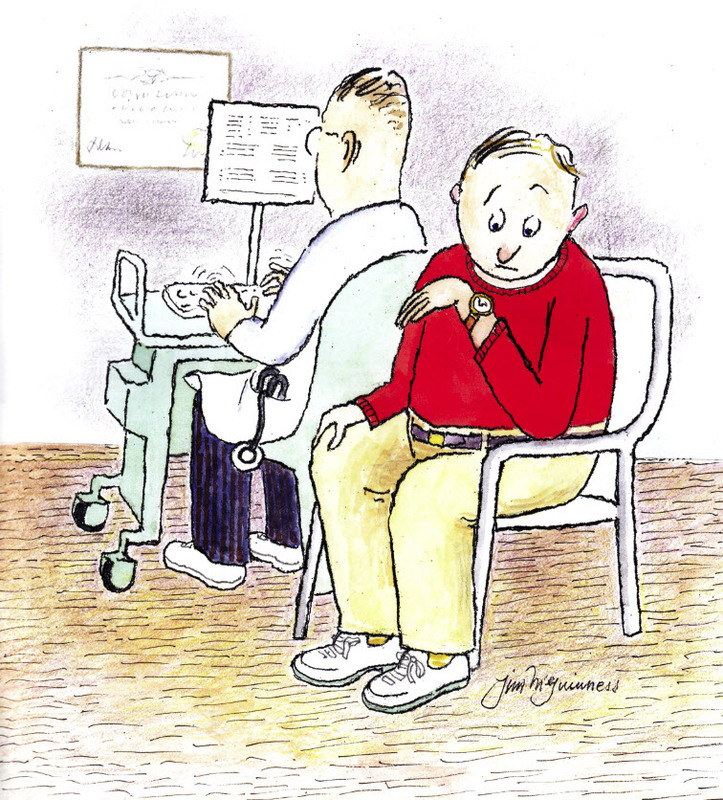 If you want to push your already frazzled doctor into the abyss ask him about the EMR. If you’re in a really sadistic mood throw in ICD 10 and its 140,000 plus codes. The Pharos is a quarterly journal published by Alpha Omega Alpha, the national honor medical society. It is typically very tolerant of government forays into medical care, but even they (the journal’s editorial staff) have been poleaxed by the EMR. The drawing below was on the cover of the Sumner 2015 issue of The Pharos. It summarizes our modern dilemma with the medical record. While we could lose the written medical record and actually talk to our patients, the computer is fungible and cannot be evaded. The old record was hack proof. The EMR is a leak waiting to be a flood. Every medical student is taught very close to day one that the first thing you do with a patient after greeting him appropriately is take a history and do a physical exam. Let me tell you about a recent medical encounter I had as a patient. After an injury that was more than minor, but less than serious I went to see a specialist who diagnosed and cared for said injury. Deciding to eschew the aggressive treatment he recommended, I made an uneventful recovery. After a few months I was discharged from his care. What was remarkable about our several encounters was that he never touched me. It’s hard – no impossible – to do a physical exam without touching your patient. My doctor, who is very highly thought of, did spend a lot of time in front of his computer screen. I’m sure Medicare and my insurance company were very happy with the forms he filled out and the boxes he checked. So, after 2,500 years the medical record continues to be a problem. Is there a fix? Probably not. Most of the basic problems of life persist because they have no solution. The next time you go to the doctor bring your smart phone so you’ll have something to interact with.